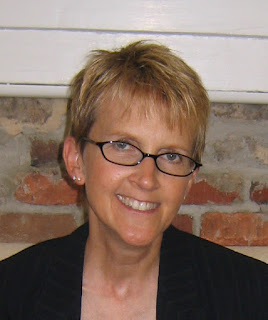 Please welcome fellow Kindle Scout winner Cindy Blackburn to the blog today. She describes herself as hard-working, an introvert, energetic, a klutz, and a cat-lover. Her writing is funny, cozy, lighthearted, feel-good, and screwball. Let’s see which questions she chose and how she answered them. We’d eat in my favorite Italian restaurant because I love spaghetti, and apparently it’s my party. I like the idea of fictional guests. Harry Potter would be lots of fun, and with his wand in hand, who knows where the evening would lead! Miss Marple would be a useful guest for me, a cozymystery writer. She could give me some new ideas on amateur sleuths. On to actual people… How about Jim Parsons? I want to tell him how much I adore The Big Bang Theory and learn about his and Sheldon Cooper’s absolute genius use of comic timing. And number four would be Janet Evanovich. As I started writing mysteries, a friend told me I should try to write funny, like Janet Evanovich. The style and humor of her Stephanie Plum series gave me lots of incentive to give it a try. I’d like to thank her. I thrive on routine, so sitting in the same spot every day really works for me. I have a comfy armchair in my living room with a place to put up my feet and put down my coffee. Unfortunately, that chair is my cat’s favorite also. She often wins the fight. And yes—she can bully me out of the coveted spot. Again, I thrive on routine, and so I hit that writing chair first thing in the morning, coffee in hand. I try to write all morning, afternoons I’m fairly useless, but often right before bedtime I can get some good ideas down. If I write a little at night I find I’m more productive the next day. I probably read about a book a month. I used to read tons more, but now that I write, I read a lot less. I like to read humorous books—cozy mysteries, chicklit, anything light. I’m not into deep or dark. I know I’m WAY behind the times but have just discovered Lawrence Block’s Bernie Rhodenbarr series. Block’s The Burglar in the Closet was my latest read. Loved it! I like to make people laugh. I want to create stories that help people (especially working women with stressful lives) escape their responsibilities for a few hours. I promise you’ll find nothing edifying or educational in my books. Silliness rules. 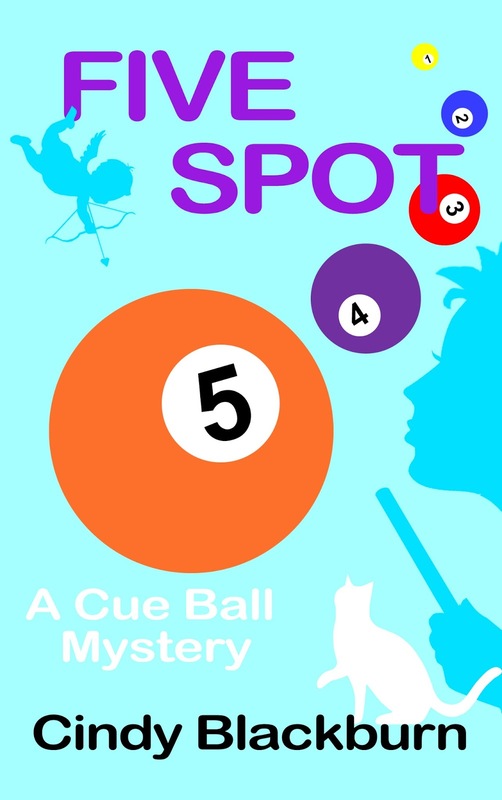 Five Spot takes place at a romance writers conference. Any romance writers I’ve ever hung out with are great fun and very interesting people, so I knew I could make the thing funny! I’m a pantser. So once I had that premise of a murder at the Happily Ever After Conference, I started writing and let the story go where it would. Write every day. I guess it goes back to the old adage practice makes perfect. Also, writing every day keeps the creative juices flowing, and it’s fun to always have my latest story and characters keeping me company, day in and day out. If you’d like to keep Cindy company, please check out her website www.cbmysteries.com, or find her on twitter (she’s a self-proclaimed fiend there!) @cbmysteries. See ya’ in cyberspace! And here is a little blurb about The Five Spot. At long last! Jessie Hewitt is about to take her rightful spot in the Hall of Fame. No, not the one for pool sharks. This is the Romance Writers Hall of Fame. Jessie's so excited she's even convinced über-hunky cop Wilson Rye to tag along for the induction festivities. But things don't go exactly as planned. How could a conference called Happily Ever After take such a wrong turn? Take a guess. Cindy, your feelings about the first draft ring a bell with me. I have to keep reminding myself that I've done it before and somehow I'll do it again. Also like you, I find revision the easy and enjoyable part. Good to know I'm not the only one who's struggling with the first draft. All the best with your book. Allan -- I too much prefer revision to writing the first draft. Good to know I'm not the only one. Right now I'm in the dreaded first draft of my next book. Ugh!! Nice review, Cindy. I'm always amazed at how disciplined you are. You make me feel unproductive, but that's because I am. I wish I could adopt your routine, then maybe I'd produce more. Love your books, Cindy. I'm glad to know you dread the first draft and like revising. So much easier, I think, when there's something to revise. Just choosing a profession for a minor character can stop me cold.